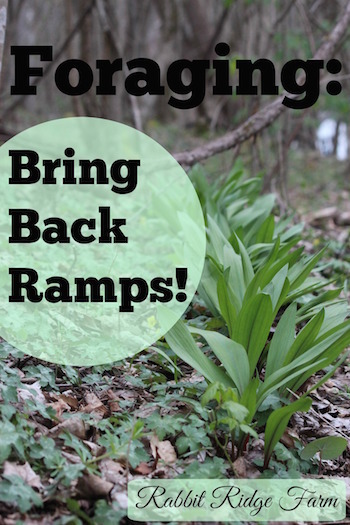 Food Foraging: Bring Back Ramps! Ramps, ramps ramps! They’re definitely one of the stars of the spring. 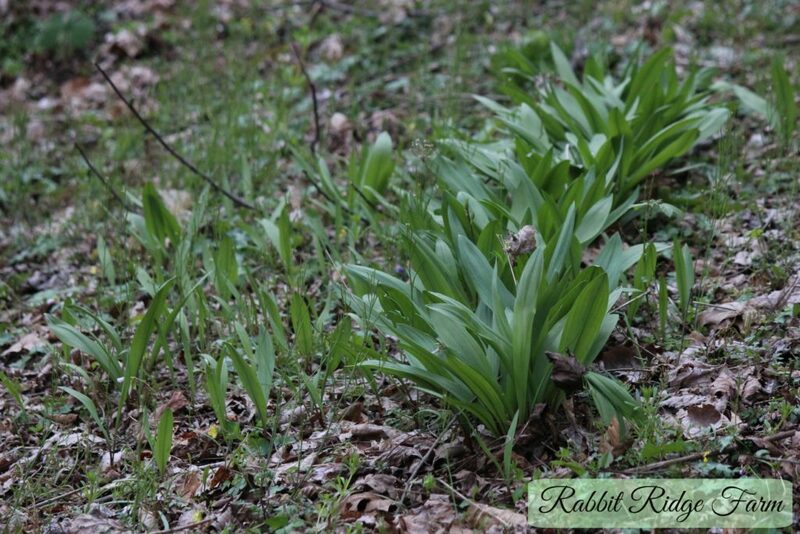 Ramps (Allium tricoccum) also known as wild leeks, spring onions, ramson, wood leeks, or wild garlic are an easily recognized and highly prized wild edible. They can be found growing up and down the east coast of North America but there’s a few thing you should no before you head to the woods to dig a bunch up. Sadly the ramp is not very quick to reproduce. If only the tasty ramp spread as readily as mint we’d all be able to dig to our hearts content but they don’t. Ramps’ slow reproduction combined with their notoriously good flavor has led to dwindling numbers. They are a protected species in Quebec and are considered a species of “special concern” in Maine, Rhode Island, and Tennessee. While they are not considered “endangered” as of yet and I have seen a lot of them in my woodland wanderings there are reasons to be concerned with their fate. First of all even if there’s a slight chance they’re on the decline they’re worth saving. If you haven’t eaten a ramp you’re really missing out. When I told Scott I have never had a ramp and morel pizza he was mortified. Scott doesn’t display strong emotions about much so I can tell you these pizzas must be a huge deal. Ramps are also pretty important culturally. They were used by many Native Americans both for culinary and medicinal purposes and all over Appalachia ramps still inspire massive celebrations. The people of Appalachia have cherished the ramp as one of the first delicious greens of spring. Loving not only its flavor but believing it helped take care of winter ailments. Is there any other plant that inspires hoards of people to take to the woods each spring and connect with their cultural heritage? Pretty awesome right? Well, these qualities are also why they’ve been dug out in many areas. Areas like where I now live. Our little section of West Virginia hills was completely ramp free that is, until Scott planted some. There used to be ramps here though so what happened? Let me tell you a little story about Winter. No, not the season winter, this place. On old maps our little slice of heaven is labeled simply as “Winter.” It was small coal mining community and a really rough place. Winters at “Winter” were hard. You were lucky, especially if you were among the young or old, to survive them. People got sick or starved on a fairly regular basis and really not all that far in the past. So it’s no surprise that people here dug literally every ramp out of these hillsides. With no grocery stores around ramps were one of the first green things people had access to each spring and they’re good! There’s a reason people believed that ramps had the power to cure some ailments it’s called vitamin C. Which was in really short supply for the people who called this area home. These people, they needed the noble ramp and while I would love to see these hills abundant with ramps again I understand why they were over harvested. However ramps are still being over harvested and it’s definitely not for survival. It’s for money, fun, and often just because people are ignorant of the ramps’ plight. I completely believe that ramps can be a renewable resource but not the way they are currently being used. Don’t harvest ramps to sell unless they’re ones you’ve grown and even then leave enough so that you re-populate your area. Try harvesting just a leaf from each plant. The leaves also have delicious flavor and it doesn’t kill the entire individual the way digging the bulb does. Never harvest from any tiny patch or harvest an entire patch. They certainly won’t reproduce if there’s none around. 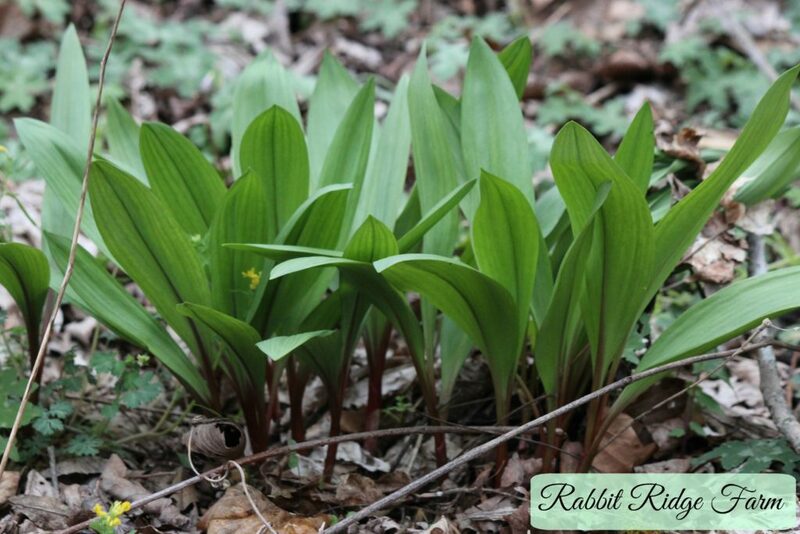 Educate anyone interested in ramps or foraging on how to do so in the least damaging way possible. If you love eating ramps but want to save them from disappearing, growing them is easier than you’d think. Ramps reproduce two ways through seeds and bulbs. Scott bought ours as bulbs and planted two small rows of them in our woods. It was just like planting flower bulbs and you don’t have to care for them! Do consider there habitat though. Unlike most domesticated plants they are adapted to forest living not full sun. This is one of our ramp patches. You’ll notice the distinct and dense line of ramps on the right. That line is what Scott planted several years ago. It has now grown much thicker as the ramps have reproduced through bulbs. The scattered ramps on the left of the picture are those that have come from seed. Simple right? Now where the heck do you find ramp seeds/bulbs? I know I’ve never seen them in a seed catalog either but there’s an awesome place in West Virginia called The Ramp Farm and you can order all the seeds and bulbs you’ll need from them to have a plentiful patch to call you own. My final two cents is to enjoy the ramp but try to aid in its conservation. When you think about the ramp you should think about the plant that meant so much for the cultures who truly depended on it to usher in the health and wellness of springtime not the one served in pricey restaurants that mock the very meaning of wild food. So when you walk in the woods this spring consider choosing not to gather the little garlicky green gems. Just visit them.